Background and Objectives: Breast carcinoma, the most common malignant tumor and the leading cause of cancer death in women, affects Iranian women at least one decade earlier. Lymphatic vessel invasion (LVI) is one of the most important prognostic factors in breast carcinoma. The aim of this study was to compare the results of detecting lymphatic invasion in immunohistochemistry (IHC) method with routine histologic evaluation. Materials and Methods: A total of 116 breast cancer specimens were evaluated. IHC staining for D2–40 marker was performed on paraffin-embedded blocks of tumor samples to detect LVI. Results: Sensitivity, specificity, positive, and negative predictive values of H and E staining for detection of the lymphatic invasion were 41%, 66%, 54.8%, and 53.5%, respectively. Kappa coefficient between H and E and D2–40 stainings was 0.078. The most common sites of lymphatic invasions were intratumoral area and tumor periphery. Conclusions: It seems that D2–40 staining is necessary for accurate diagnosis of LVI in breast cancer. Furthermore, evaluation of intratumoral area and tumor periphery can probably increase the chance of finding lymphatic invasion. Although breast carcinoma is relatively less common in Iran, its occurrence has been increased recently., Breast cancer involves Iranian women at least one decade earlier , more than 30% of Iranian patients are younger than 30 years, while in western countries, only 6% of patients are younger than 40. On the other hand, almost 70% of Iranian women present in advanced noncurable stages. Breast cancer prognosis is related to different factors including age, tumor size, grade, histologic type, lymphatic vessel invasion (LVI), lymph node metastasis, and expression of hormone receptors., Among them, LVI and lymph node metastasis are the main prognostic factors in patient's survival., Furthermore, LVI plays a critical rule in cancer metastasis. It is considered as an independent prognostic factor in lymph node-negative patients with mortality of breast cancer increases from 29% to 53% in node-negative patients with LVI.,, This emphasizes the importance of correct detection of LVI. The aim of this study was to use specific markers to detect LVI in invasive breast carcinomas and compare the results with routine H and E evaluation of the specimens. This retrospective study was conducted on 116 consecutive cases of invasive breast carcinoma underwent excisional biopsy, lumpectomy, or mastectomy with axillary lymph node dissection in Urmia University of Medical Sciences, Urmia, Iran, during March 2011 to June 2014. The research was approved by the Ethics committee of the university. Histopathology slides of all 116 cases were retrieved from archive of the pathology department. Histological type of tumor, LVI, and lymph node metastasis were confirmed by reviewing the H and E stained slides. To evaluation of LVI, according to Aishima et al., three different areas including intratumoral area, tumor periphery (a 0.2 cm wide band of tumor adjacent to the invasive fronts), and peritumoral area (a 0.2 cm wide band of nontumoral tissue adjacent to the invasive front) were studied. IHC staining was performed on 4 μm thick sections obtained from paraffin blocks. D2–40 (clone D2–40, DAKO Corporation, Glostrup, Denmark) was used to detect LVI. All IHC stained slides were blindly studied by the same pathologist without any knowledge of the related H and E staining results. The results are expressed as the mean ± standard deviation (SD). Statistical analysis was performed using SPSS software version 16 (SPSS Inc., Chicago, IL, USA). Normality of data was evaluated with the Kolmogorov–Smirnov, Mann–Whitney U test, Chi-squared, and Fisher's Exact tests were used for the evaluation of the relationship between variables. A value of P < 0.05 were considered as statistically significant. Cohen's Kappa test was also used to evaluate interrater agreement for qualitative (categorical) items. The age of the patients ranged from 20 to 86 years (mean ± SD: 48.96 ± 11.09). Of 116 cases, three of them had no residual tumor in mastectomy specimen because the whole tumor was removed in the previous lumpectomy. Hence, the study was conducted on 113 mastectomy samples. Of these 113 specimens, 100 cases (88.49%) were invasive ductal carcinoma, 11 were (9.74%) invasive lobular carcinoma, and 2 were (1.77%) unclassified. LVI was detected in 42/113 (37.17%) cases by H and E staining, and 56/113 (49.55%) by D2–40 IHC staining method. In 23 (41.1%) of these 56 cases, LVI was also detected by H and E staining, but the other 33 cases (58.9%) were reported as negative in H and E slides. Thus, the false-negative result of H and E staining in the detection of LVI was 58.9%. Of 57 cases described as LVI negative in D2–40 staining, LVI was reported as positive in 19 cases (33.3%) in H and E staining. 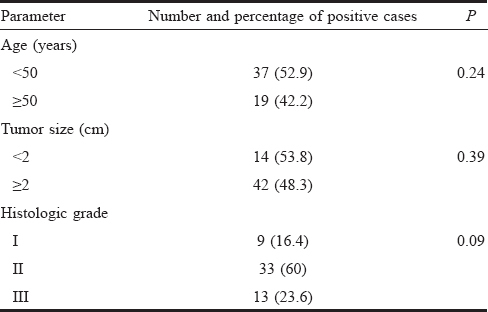 Thus, the false positive rate of H and E staining was 33.3% [Table 1]. Sensitivity, specificity, positive predictive value (PPV), and negative predictive value (NPV) of H and E staining method in detecting LVI were 41%, 66%, 54.8%, and 93.5%, respectively. Kappa coefficient factor for H and E and D2–40 IHC staining was 0.078. The most common sites of LVI documented by D2–40 staining were intratumoral and tumor periphery areas [Figure 1]. No relationship was observed between patient's age, tumor size, or histologic grade and LVI in IHC method [Table 2]. In this study, we used IHC staining method to identify lymphatic invasion (using D2–40 marker) in breast cancer specimens. We tried to compare the results of IHC staining with routine histopathologic evaluation method, H and E staining, to find whether further detection methods are needed during our routine pathologic evaluation. In this study, H and E and D2–40 IHC staining methods detected LVI in 42/113 (37.17%) and 56/113 of cases (49.55%), respectively. Similarly, de Mascarel et al. found 39 LVI using IHC staining and 14 by H and E in their 94 evaluated breast cancer specimens. Sensitivity, specificity, PPV, and NPV of H and E staining in the detection of LVI in this study were 41%, 66%, 54.8%, and 53.5%, respectively. These results were reported as 20%, 97%, 50%, and 88.6%, respectively, by Debald et al., showing the insufficiency of H and E staining in the detection of LVI in breast cancer. Comparable with our results, Marinho et al., found increased LVI detection from 17/123 cases (13.8%) by H and E staining to 35/123 cases (28.5%) using D2–40 IHC staining. Although their Cohen's Kappa factor for diagnostic agreement between these two methods was 0.439 (moderate) comparing to 0.078 (poor) obtained in this study. False-negative and false-positive results of H and E staining were 59.8% and 33.3% in our results which were frankly higher than 10.8% false-negative and 2.7% false-positive results reported by Debald et al. This may be related to the expertise of the pathologists reporting the samples. We also found intratumoral and tumor periphery areas as the most common sites for detection of LVI (55.5% and 62.5% of cases, respectively). Only 27% of cases, LVI was found in the peritumoral area, while in the study of Mohammad RAA et al., the most common area of LVI was peritumoral area (76%). Although in this study, tumor periphery was not evaluated. Evaluation of other tumoral organs such as bladder and biliary tract also revealed different results. In bladder tumors, the peritumoral area was the most common site, but in biliary tract tumors, LVI was observed most commonly in tumor periphery. In summary, we found a significant increase in identification of LVI using IHC staining besides routine pathologic evaluation of breast cancer specimens. As the LVI is an important prognostic factor in breast cancer, we suggest using IHC staining beside routine evaluation of breast cancer specimens to better detect LVI. The authors are grateful to Mr. Ali Jafari for his technical assistance. The study was funded by Urmia University of Medical Sciences, Urmia, Iran. Rosai J. Rosai and Ackerman's Surgical Pathology. 10th ed. Edinburg: Mosby; 2011. Mohammed ZM, McMillan DC, Edwards J, Mallon E, Doughty JC, Orange C, et al. The relationship between lymphovascular invasion and angiogenesis, hormone receptors, cell proliferation and survival in patients with primary operable invasive ductal breast cancer. BMC Clin Pathol 2013;13:31. Shahkhodabandeh S, Piri Z, Asadi M, Chakhmakhchi Dovom N. Breast cancer in Iran: Iranian scientists approach to breast cancer research in medline database. Iran Q J Breast Dis 2009;2:49-59. Mousavi SM, Montazeri A, Mohagheghi MA, Jarrahi AM, Harirchi I, Najafi M, et al. Breast cancer in Iran: An epidemiological review. Breast J 2007;13:383-91. Marinho VF, Metze K, Sanches FS, Rocha GF, Gobbi H. Lymph vascular invasion in invasive mammary carcinomas identified by the endothelial lymphatic marker D2-40 is associated with other indicators of poor prognosis. BMC Cancer 2008;8:64. Song YJ, Shin SH, Cho JS, Park MH, Yoon JH, Jegal YJ, et al. The role of lymphovascular invasion as a prognostic factor in patients with lymph node-positive operable invasive breast cancer. J Breast Cancer 2011;14:198-203. Rakha EA, Martin S, Lee AH, Morgan D, Pharoah PD, Hodi Z, et al. The prognostic significance of lymphovascular invasion in invasive breast carcinoma. Cancer 2012;118:3670-80. Fiedler U, Christian S, Koidl S, Kerjaschki D, Emmett MS, Bates DO, et al. The sialomucin CD34 is a marker of lymphatic endothelial cells in human tumors. Am J Pathol 2006;168:1045-53. Wilting J, Papoutsi M, Christ B, Nicolaides KH, von Kaisenberg CS, Borges J, et al. The transcription factor pro×1 is a marker for lymphatic endothelial cells in normal and diseased human tissues. FASEB J 2002;16:1271-3. Marinho VF, Sanches FS, Rocha GF, Metze K, Gobbi H. D2-40, a novel lymphatic endothelial marker: Identification of lymphovascular invasion and relationship with axillary metastases in breast cancer. J Bras Patol Med Lab 2008;44:45-50. Aishima S, Nishihara Y, Iguchi T, Taguchi K, Taketomi A, Maehara Y, et al. Lymphatic spread is related to VEGF-C expression and D2-40-positive myofibroblasts in intrahepatic cholangiocarcinoma. Mod Pathol 2008;21:256-64.
de Mascarel I, MacGrogan G, Debled M, Sierankowski G, Brouste V, Mathoulin-Pélissier S, et al. D2-40 in breast cancer: Should we detect more vascular emboli? Mod Pathol 2009;22:216-22. Debald M, Pölcher M, Flucke U, Walgenbach-Brünagel G, Walgenbach KJ, Höller T, et al. Increased detection of lymphatic vessel invasion by D2-40 (podoplanin) in early breast cancer: Possible influence on patient selection for accelerated partial breast irradiation. Int J Radiat Oncol Biol Phys 2010;77:1128-33. Mohammed RA, Martin SG, Mahmmod AM, Macmillan RD, Green AR, Paish EC, et al. Objective assessment of lymphatic and blood vascular invasion in lymph node-negative breast carcinoma: Findings from a large case series with long-term follow-up. J Pathol 2011;223:358-65. Ma Y, Hou Y, Liu B, Li X, Yang S, Ma J, et al. Intratumoral lymphatics and lymphatic vessel invasion detected by D2-40 are essential for lymph node metastasis in bladder transitional cell carcinoma. Anat Rec (Hoboken) 2010;293:1847-54.